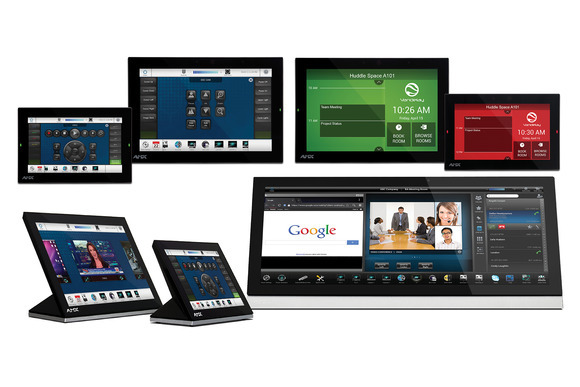 NORTHRIDGE, California – Today, HARMAN Professional Solutions announced a new lineup of control and room scheduling interfaces from its legendary AMX family of products – the new AMX Modero G5 Touch Panels and AMX Acendo Book Room Scheduling Panels. To better serve its customers, AMX has completely refined its touch panel product lines to create a single, five model lineup that draws on the best features of its award-winning Modero X and Modero S control panels, Acendo Book room scheduling panels, and G5 and G4 processing engines. The new lineup is designed to support the unique and widely ranging interface needs of corporate, education, government, hospitality, and large venue customers. Five product SKUs cleverly deliver customers their choice of the most popular configurations and screen sizes. The new models simplify ordering, support, and technical updates by offering customers a software-configurable choice of control or room scheduling functionality (7” and 10” wall mount models). The new touch panels are available in tabletop and wall mount models, with 7”, 10”, and 20” screen sizes. For support of government and other sensitive applications, all of the new tabletop models do not include a microphone and all wall mount models may have their microphones disabled by software, physically detached, or both. We invite you to learn more about the new lineup of AMX control and room scheduling panels. For more information on the complete line of AMX corporate, education, and government-focused solutions, please visit amx.com.